Two purse boats "making a set" in the Chesapeake Bay while the mother ship awaits. 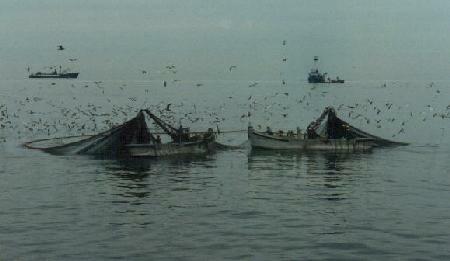 The 1940s off Beaufort Menhaden fishermen "hardened" the fish. The mostly African-American crew would sing work songs while pulling in rhythm. Barbara Garrity-Blake wrote The Fish Factory (University of Tennessee Press, available locally at Dee Gees in Morehead City or Amazon.com). 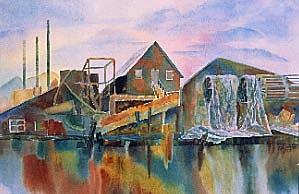 She spent two years immersed in the fish factory culture of North Carolina and Virginia, riding the boats, interviewing fishermen, and collecting the old work songs. 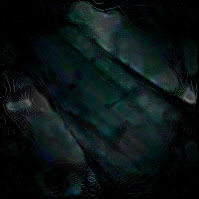 Menhaden is a bony fish that is factory processed into oil and high-protein meal used in livestock feeds. 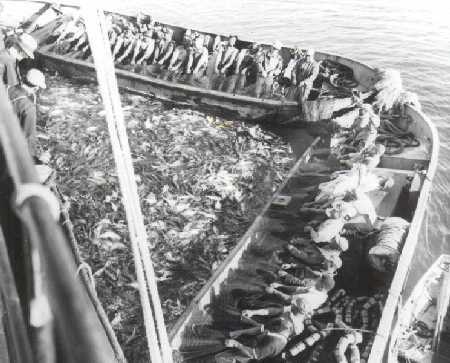 Garrity-Blake chronicles the history of the fishery, from the days when the smell of menhaden was the “smell of money”, to today as factories give way to condominiums. 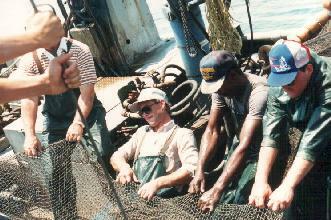 Crewmen used to lift heavy nets of fish by singing work songs in the African style of “call and response”. Singing coordinated their pulling, but the old timers say it also helped generate a special boost of power to lift what could not otherwise be lifted by human strength alone. Captains could find schools of menhaden by reading signs, like the hue of the water, the presence of “whips” or splashes, or what was revealed to them in a dream. 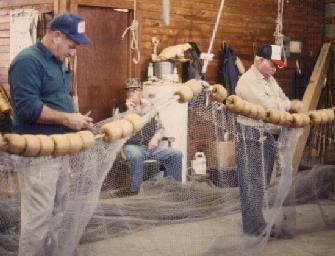 Some of the old timers mending nets at the last remaining fish factory in NC (Beaufort), now closed.